You get a mix of personalities at every table you wait on. There are days when every single customer seems to have walked through the portal of hell instead of the front door and instead of being greeted with a smile – you are looking into the faces of the demon possessed patron who is determined to make you feel as miserable as their boss/wife/dog/children/car/teacher/social worker/client has made them feel all day and there is nothing you can do but put on your best “I’d really like to cry in your soda right now but it’s my job to make sure you have a great experience…even though I would love nothing more than to shave my armpits and cover your burger in my beauty” smile and know that no matter how polite, kind, sweet, attentive, accommodating or helpful you are – they will tip you less than a handful of change and attempt to fill your soul with ugliness. Sometimes, you luck out and get the cute little old couple who, before they even take a seat, have asked you how your day is going and then tell you to “Take your time honey!” when you tell them that it’s lunch rush and it might be a few minutes before you get back to them with their drink order. Sometimes you find yourself face to face with a “Hangry” person (Hungry+Angry…you know..when they have forgotten to eat all day and finally come in for what should have been lunch but is now well past dinner) and you can tell by their snappy short answers and their glossed over eyes that they are fighting the urge to shout “FEED ME NOW!! !” but their usual sweet selves refuse to allow their hunger to get the better of them. There are days when you have a table filled with a bunch of rude professionals, who each order individually and want separate tabs and seem to delight in making you feel extremely uncomfortable and self conscious every time you lean over to fill a water glass. Often, you are faced with the disaster that comes along with a young family who lets their child thrown tantrums in the middle of dinner rush because their crayons aren’t the color they need and who get up and leave the kind of mess that you should only really see in a natural disaster movie….cheerios ground into the carpet, ketchup used as finger paint, tongue prints on the mirror..do people let their children behave this way at home? Sometimes you feel like dropping the tray of food you are about to carry out to the table of disgusting, foul mouthed jerk faces – and shouting “Get it yourself! I QUIT!” and walking out – never to be seen or heard from again. And then there are times, rare times…when you are having an exceptionally bad day and the only table in the place who has treated you with any kind of respect or kindness, has left you a thank you note and complimented your smile. Just because they knew you needed it or ..or maybe they didn’t know you needed it but wanted to tell you that you are beautiful – just because. Those are the times when you realize that sometimes – people actually appreciate you and how hard you have worked and have completely changed your outlook on your day. Next time you are out for a meal on the town with your family or co-workers or church group or…alone – take a few minutes to write a thank you note (Personally, if you can remember your servers name) and compliment them on their service, their smile, their kindness or something they went out of their way to do for you. Have your children color a picture for them on the back of their place mat and have everyone write a thank you note…and leave it on the table for them to find later. You have no idea how amazing it feels to clear a table and find a hand written thank you note from a satisfied customer waiting for you. Sometimes – all it takes to change someone’s day – is a simple thank you…especially for those who’s job it is to “serve you” no matter how you treat them. 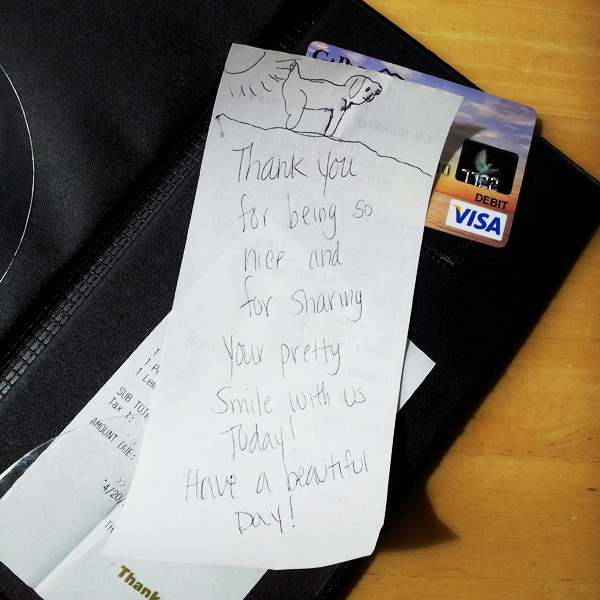 This entry was posted in Random Acts of Kindness and tagged customer service, food service workers, kindness, pay it forward, Servers, thank you notes, wait staff, waiter, waitress by Jen Owen - e-NABLE. Bookmark the permalink.